I've been feeling a bit under the weather for the last week with a cold bug. Haven't had the energy to do any crafting until now. This card was cut out with my Silhouette Cameo using a new studio cutting file I bought at the Silhouette store. Other supplies that I used are Bazzill blue and GP white cardstock, pearls and twine. Changed the design so the blue layer is sized at 4.75" and cut out two butterflies. Mounted the butterflies at a angle then folded the wings up on the top layer to give it a little more dimension. Glad to hear that you feeling better, it's always miserable to be under the weather. 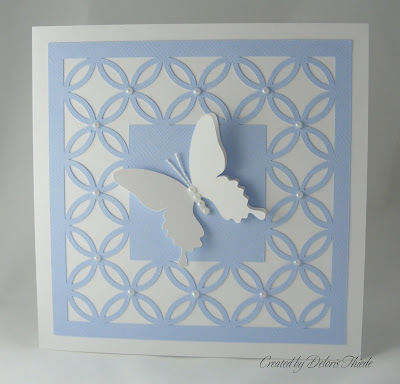 Love your pretty CAS card, the back ground is just gorgeous with that butterfly... Enjoy your happy weekend! Beautiful and so soft! I'm so sorry you r under the weather. I saw that on your last post. I will write this evening or tomorrow to catch up. What I need to be doing is putting a card in the mail to you. Love this card - gorgeous color. Glad you were able to join us at Get Creative Challenges. Simple yet beautiful. Thank you so much for joining us at Polkadoodles challenge.